Who needs the UFC when you’ve got ONE FC? 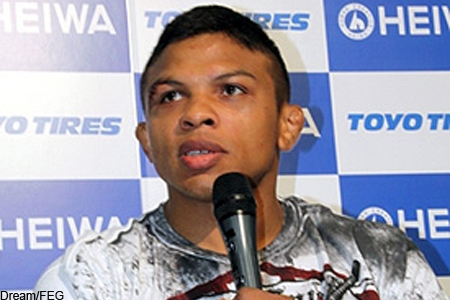 That’s what Bibiano Fernandes (Pictured) asked himself before turning down an offer to join the planet’s premier mixed martial promotion in favor of the Singapore-based company. ONE FC reported their latest acquisition on Twitter late Tuesday night. Fernandes will make his organizational debut against a yet-to-be named opponent on August 31st in Manila, Philippines. Earlier this month, the UFC announced they had inked the Brazilian to a multi-fight deal and he would be breaking in his contract against Roland Delorme at UFC 149. However, the promotion claimed just one week later that an injury had forced Fernandes out of the July 21st event. “The Flash” then came out the following day stating he was healthy and that he never agreed to take his talents to the Octagon. UFC president Dana White later said Fernandes is a grown man and can do whatever he chooses. After losing the Dream featherweight belt to Hiroyuki Takaya, Fernandes shed 10 pounds and ran through Dream’s Bantamweight Grand Prix like a freight train. The 32-year-old posted a TKO victory over veteran Antonio Banuelos in the tournament finals in December to capture the crown.